Scrubbing audio is probably the fastest way to skip through and navigate within a playing audio track, and iOS allows you to scrub active tracks directly from the Control Center. There’s not much to it and scrubbing is done through a fairly simple gesture, but because the tap touch target is quite small it can take some practice to get right. 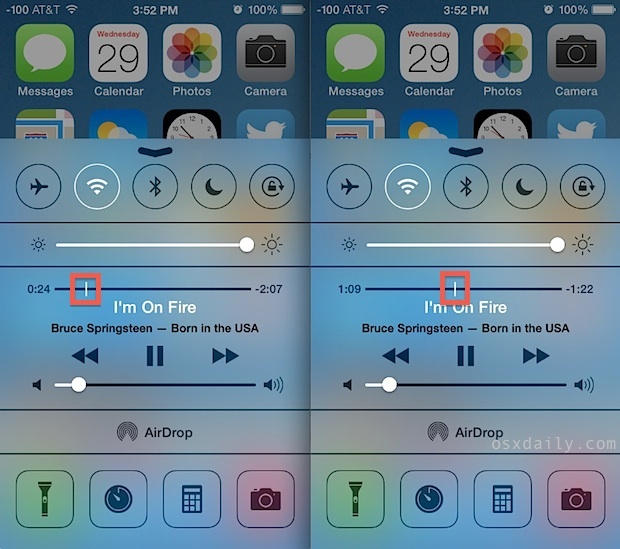 You can scrub through any playing song, music, podcast, or show on the iPhone, iPad, and iPod touch. Let’s review this nice feature, available anywhere in iOS via Control Center. Scrubbing tracks from Control Center works anywhere that you can summon the feature from on an iPhone or iPad, be it the Home Screen, within an app, or the lock screen. Note that you can not scrub audio tracks playing from a streaming service like iTunes Radio, the feature is limited to audio stored directly on the iOS device. Is this a “iOS beginner” article or am I missing something? I just signed up for your newsletter and may have misunderstood what this site is about. We cover a wide variety of topics, skills, and tutorials at various skill levels, from beginner to advanced. Just stick with it, @Harper. I’m nowhere near a beginner, but do find some pretty cool and useful or, in this case, just plain fun things here. Oh. And pictures. Lots of pictures. It would be good if these stories were bylined, though. Thanks Michael! There is a byline but it’s currently split up between date, author, and topics. Should probably be consolidated into a single section, good idea! There is a trick to move this slider very precisely (even second by second). While you are touching the slider with your finger, drag it down and then, without releasing your finger, drag it left or right. You will see that the scan will be the more precise the more you drag it down. apologies but you fail to mention what iOS version you are on. I’m on 7.1 and I don’t have the large vertical bar and not mater how hard I try I can’t move it. Does something need to be activated for scrubbing to work? what happen to the skip forward and backwards buttons, they were very handy.